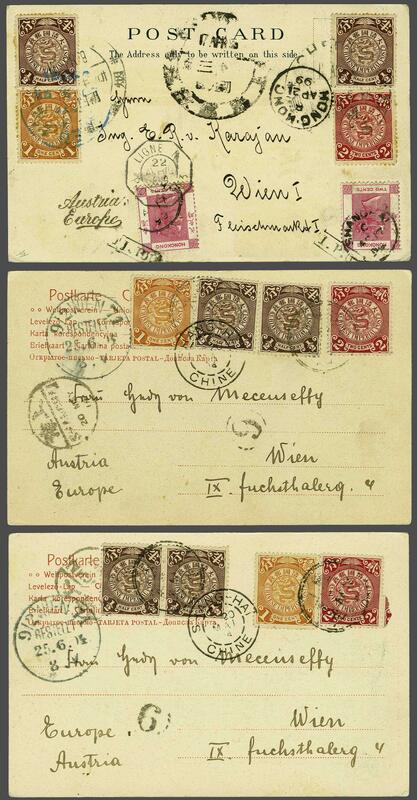 1899: Postcards (3) all addressed to Vienna, Austria all three with Coiling Dragon frankings at 4 c. rate (2x½ c. brown, 1 c. orange-yellow and 2 c. red), two cards mailed from Shanghai via French Post Office, the third card mailed from Chefoo with Coiling Dragon franking tied by CHEFOO Dollar Chops in black with additional Hong Kong 2 c. rose (2) tied by framed "I.P.O." handstamps in black and by 'Shanghai' cds's (April 17) with Hong Kong transit and French octagonal Paquebot datestamp. A scarce and attractive group.